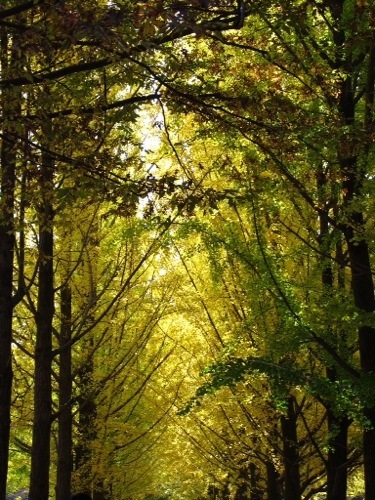 Nami Island is a relatively “new” tourist attraction just outside of Seoul, Korea. 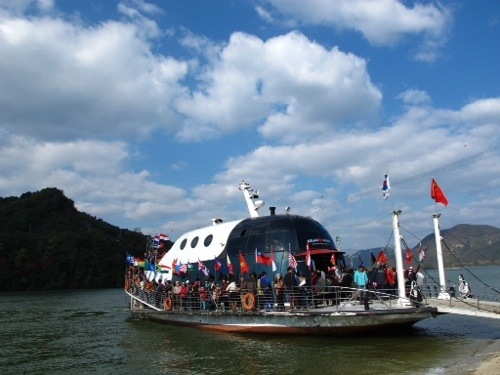 Many tourists “drop by” this half-moon shaped island which can be reached via an hour’s drive from the capital and a short 5 minute ferry ride across the Han River. A day or half a day spent here may be enough soaking in the beauty of this island which showcases nature in all its splendor. I hear they turn off all lights in the evening to allow guests to “commune with nature” while in this tiny island spanning only 4 kilometers in diameter. Must be quite an experience especially during Autumn when one hears fallen leaves “crunch” while squirrels run over them in the dead of night. One of the ferries crossing Han River towards Nami Island. 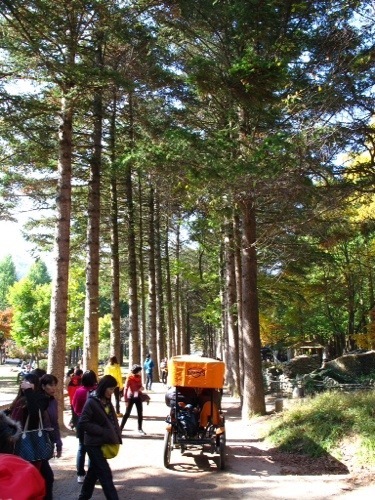 “Winter Sonata” made this island even more famous! I sensed the question coming as soon as we lined up for the ferry ride. The arch bearing the name NAMINARA REPUBLIC caught the eye of one of my elves. Confused that there’s a republic within the Republic of Korea, I was caught off-guard. I didn’t know! So I shoo-shooed my little man to ask our Tour Guide. Naturally, I was all ears listening to the guide’s spiel as it was obviously not the first time the question was raised. Choose your Season. Winter or Spring? 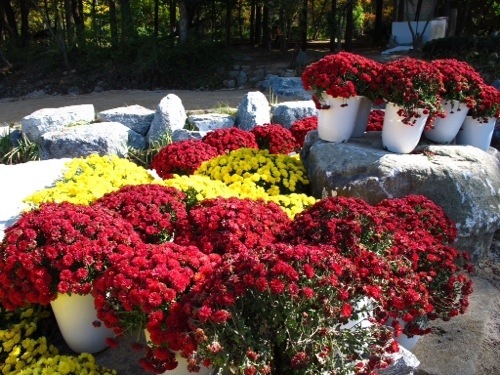 We came in Autumn and look what we found! 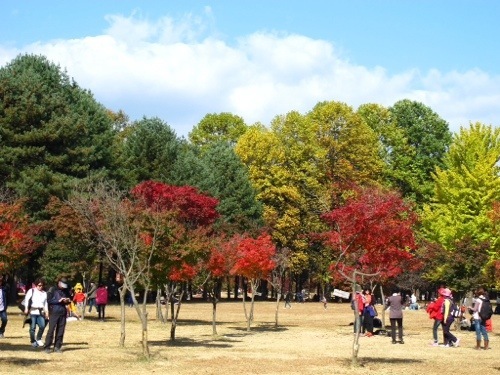 Once a desolate piece of land, one man’s love for art, nature and music and his dream to share such partnership of Nature and Culture with the world gave birth to the Nami Island we enjoy today. The former Governor of the Bank of Korea bought the island back in 1965 as he prepared for a life of leisure with Nature in his retirement. Not just a banker, Mr. Minn also founded the very first symphony orchestra in Korea. The highly-cultivated island (recreated under the helm of a very cultured visionary) hosted many cultural events nearly every weekend and attracted moviedom’s producers as location for some popular movie and television series drama. NAMINARA Republic declared its CULTURAL independence in 2006 and adopted, rather “invented”, its own anthem, flag, currency, passport and “certificate of citizenship.” Truly, one can’t help admire Mr. Minn’s vision and determination. The island is teeming with flowers and trees. Nature at its best! 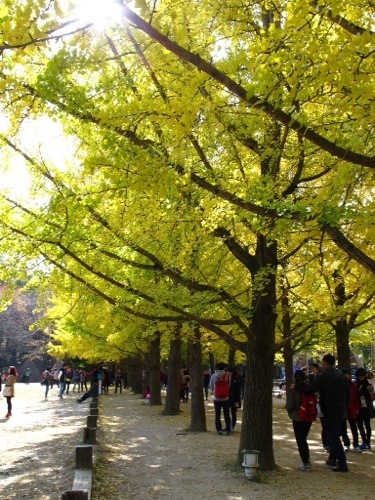 Thrilling to walk between two rows of these lovely trees. Very romantic! Beautiful Lili! Will make a point of visiting it next time we”re in Seoul! Thanks for sharing! Stay IN the island hotel and tell me about it!